We found a rare listing on Gunbroker.com — not one but TWO Tikka 595 Master Sporters with full upgrades by Mac Tilton (MT Guns). One rifle will be sold — the buyer elects which of the two guns he prefers. On these two (2) rifles, the cheekpiece has been reshaped and the adjuster upgraded. In addition, an adjustable buttplate has been added. Most importantly, both rifles have been fitted with custom, match-grade Tru-Flight barrels. Just adding a custom barrel like this to a Tikka can easily cost $475.00 or more (per rifle), including chambering and fitting. Yet these rifles, one chambered in .223 Rem and the other in 22-250, are listed “no reserve” with a current bid of $515.00 as of 3/8/2010. IMPORTANT: The seller is listing TWO (2) rifles, but he is only selling ONE (1). The successful bidder gets his choice of caliber and the seller retains the other rifle. Box stock, a Tikka Master Sporter in .223 Rem can command $1000.00 — with factory barrel. So there’s an opportunity for a very good buy here. NOTE: In the photos both guns are shown with scopes. The scopes and rings are NOT included in the auction, but one (1) Nikon variable may be purchased separately. The auction ends 3/13/2010 5:22:00 PM ET. 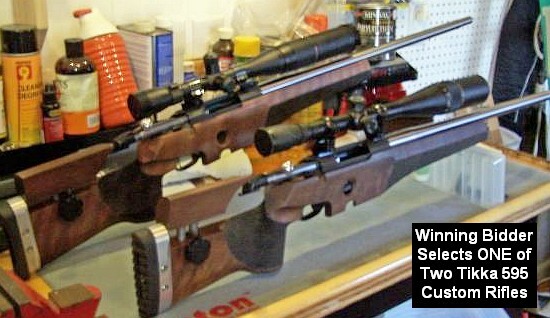 Share the post "Customized Tilton-Built Tikkas on Gunbroker.com"